This year marked the implementation of DSM-5.0. After a great deal of debate, data will now be generated elucidating how this revision affects incidence (and services). In March, the CDC reported the epidemic numbers of children affected by ASD. Somehow, a prevalence rate of 1/42 affected boys has not produced a significant call to action. Also, JAMA Pediatrics published a clinical trial that documented the successful use of probiotics for the prevention of colic, regurgitation and functional constipation. Now, there is “a prospective, multicenter, double-masked, placebo-controlled randomized study” about this natural method of assisting G-I health. Goodbye Miralax®. Google announced in June their collaboration with Autism Speaks “…to sequence the whole genomes of 10,000 individuals in families affected by autism around the world.” The strength of the ‘cloud’ will be brought to bear upon identification of this enigmatic condition. In July, the government ruled that, despite the facts that antibiotics in our meat have been demonstrated to be harmful, the FDA doesn’t have to do anything about it. Apparently, their tag line, “Protecting and Promoting Your Health,” is subject to debate. 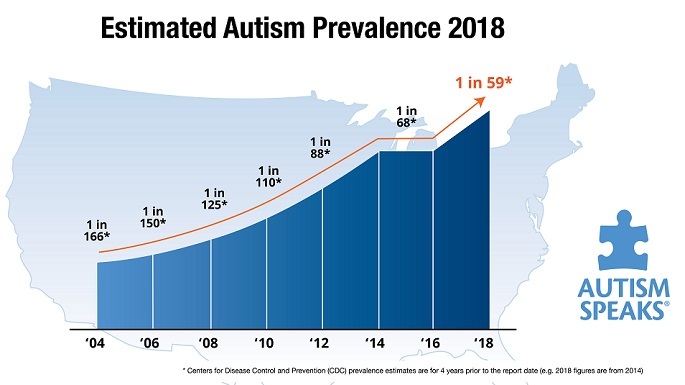 The issue of a vaccine-autism connection endures. Parents continue to be concerned as they learn about the CDC whistle blower and research implicating product grown on fetal tissue. Most medical doctors continue to consider this as a nonexistent issue and side with those who claim no connection. September marked the publication of a University of California MIND Institute study documenting that early intervention is overwhelmingly able to reverse the course of autism in very young children. Throughout the year, stories about elopement and mental illness associations have been reported in the media. Very little has been accomplished by way of understanding or prevention. An increasing prevalence of ASD is certain to lead to more frequent occurrences. In October, Johns Hopkins’ researchers published a report of significantly “… improved behavior compared with 15 placebo recipients…” by the administration of sulforaphane, a product derived from broccoli sprouts. It may be some time before the concentrated product is available for patients, however. As the year is coming to a close, the scientific journal Autism has just published a study showing that “… core features are weakly related to medication use.” The medications that doctors are using aren’t working. Not a big surprise, but this adds to the list of studies that fail to demonstrate efficacy from conventional medicine. Progress is steady, but excruciatingly slow for patients, families and professionals. Is it any wonder that parents continue to research and seek alternative and complementary treatments for their moderately-to-severely affected offspring? This entry was posted on Sunday, November 9th, 2014 at 3:56 pm	and is filed under >ALL<, Alternative and Complementary Medicine for ASD, Autism Therapies, Conferences, Gastrointestinal Issue, Patient experiences, Research, Reversing autism, Speech and Language. You can follow any responses to this entry through the RSS 2.0 feed. You can leave a response, or trackback from your own site.